The Mangalarga Marchador (MANGA LARGA MARSCH A DOOR) or Marchador for short, is an excellent choice for an all-around competition horse, a family horse or a horse chosen by aging riders. It is all those things because of its willing nature, smooth gaits and athletic versatility. Bred for centuries in Brazil to be sound and square, with good bones, you can now enjoy one here! They have that Iberian beauty and soft, kind eye. You know you have a good horse the minute you lay eyes on one! In Brazil, Mangalarga Marchadors must pass rigid standards for conformation, gait, performance and endurance. The Mangalarga Marchador is their National Horse, a national treasure. Our breeding program endorses that rigor in selecting horses eligible to breed and bear the international mark of quality – the horseshoe M brand of the ABCCMM. All of our foundation breeding stock have been inspected and approved for breeding by the ABCCMM, either in Brazil, or here in the U.S.. 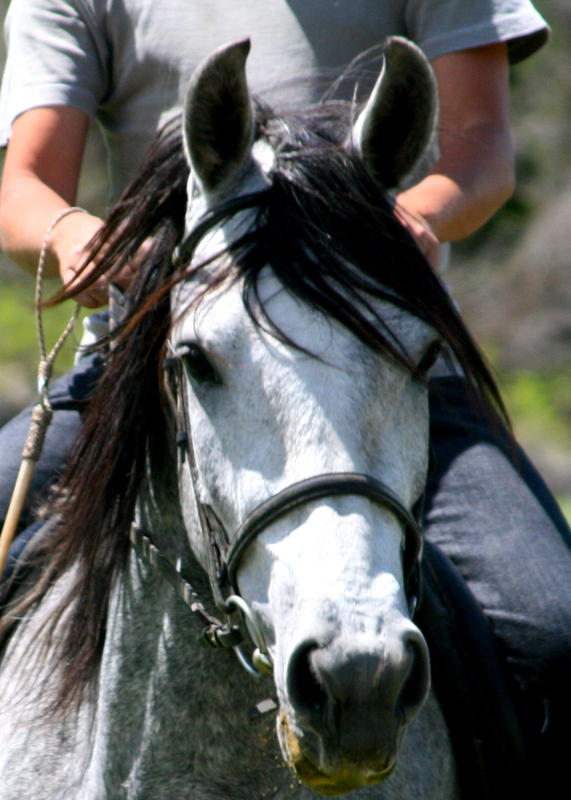 The most popular and widespread horse in Brazil is the Mangalarga Marchador, which developed in 1740. 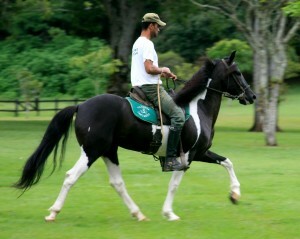 Joao Francisco of Portugal settled in Brazil at the hacienda Campo Alegre, where the Marchador horses began to emerge. Francisco adopted the surname Junqueira to designate his native city. One of his twelve children, Gabriel Francisco Junqueira, the Baron of Alfenas, is credited with the expansion and development of the breed. His friend, Dom Pedro I (1798−1834), Emperor of Brazil and son of Joao IV of Portugal, gave him an Alter Real stallion named Sublime. The stallion Sublime was the descendant of two horses brought from the breeding farm Coudelaria Alter do Chao in Portugal by Dom Joao VI during the invasion of the Iberian Peninsula by Napoleonic troops. In Brazil, Sublime was crossed with mares of the hacienda Campo Alegre: Spanish Jennets, Criollos and Andalusians. Most of the Spanish horses used at the hacienda in launching the breed were the famous Spanish Jennet, known to be a fast, smooth ambler. The offspring of Sublime produced horses with the characteristics of the present-day Mangalarga Marchador horse: docility and smooth gaits, with a cadenced rhythmic gait called the marcha.